All Fantasy Football, All The Time. 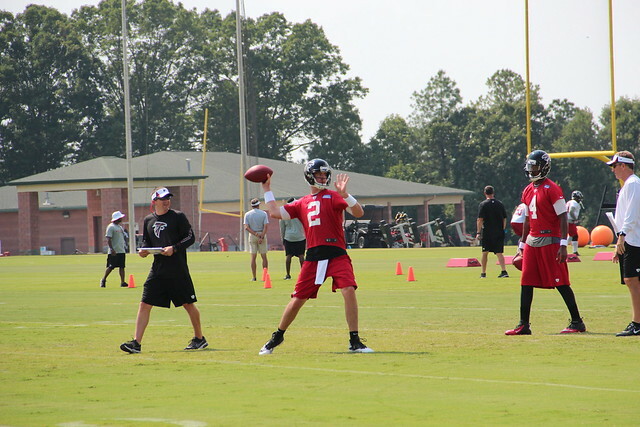 Matt Ryan – Ryan had a massive day in the Falcons home opener against the Saints throwing for 448 yards and 3 touchdowns. We spotlighted Ryan as a quarterback to target earlier in the pre-season, so hopefully you were able to get him at a bargain. If everyone stays healthy in Hotlanta it could be a career year for Matty Ice. Le’Veon Bell – Rushed for 109 yards and a score plus another 88 yards on 6 receptions against the Browns. Bell’s stock dropped following his marijuana arrest, but he looks to be every bit of a first rounder so far. Antonio Brown – Brown led the Steelers in receiving with 116 yards and a score on 5 grabs. He also kung fu kicked a punter in the face so it was a good day all around for the underrated receiver. Cordarrelle Patterson – It was a slow day in the air for Patterson (just 3 catches for 26 yards) but that didn’t stop one of the league’s most explosive offensive weapons. Patterson rushed three times for 102 yards, including a 67-yard touchdown run. Patterson is a raw, but incredible talent and if he can pull it all together he could be one of the league’s best as soon as this season. Matt Forte – Forte was an all around threat rushing for 82 yards and catching 8 passes for 87 yards in the Bears week one loss to the Bills. Now that’s how you follow up on a career year… maybe Jamaal Charles took notes. AJ Green – Caught six passes for 131 yards and a touchdown against the Ravens in week 1. Just AJ Green doing what AJ Green does. Brandin Cooks – Cooks caught 7 passes for 77 yards and a touchdown on Sunday, plus he added an 18 yard rush for good measure. Cooks looked very impressive and appeared to have a good rapport with Brees. We loved Cooks coming in to the year and if he is somehow available in your league get him now, but the window to buy low on him is all but closed. Allen Hurns – The Jags forgotten rookie exploded in the first half for 110 yards and 2 touchdowns on four receptions but was held without a catch in the second half. Although it was an impressive debut for the rook, I’m not going all out for him in waivers this week. The Eagles second half adjustment tells me they simply didn’t account for him enough and he was quickly shut down when they did. That said, if you’re desperate for receiving help he’s worth a shot. Cam Newton – Newton was held out of the team’s week 1 matchup with the Bucs, giving Derek Anderson the keys to the car in his absence. Anderson did a solid job throwing for 230 yards and two scores, but Peter King is reporting that Newton will start in week two. Doug Martin – Left the team’s week 1 matchup against the Panthers with a knee injury and was unable to finish the game. Martin had a pathetic 9 yards on 9 carries so he’s done little to quiet his doubters so far. Keep an eye on his status for week 2 and grab Bobby Rainey as a handcuff between now and then. Alshon Jeffery – Suffered a minor hamstring injury and was held out of the fourth quarter / overtime. The injury does not appear to be serious and it looks like he should be good to go in week 2. Jordan Reed – Reed came in to the game nursing a hand injury and left the game with a hamstring injury after trying to jump over a defender. Reed will undergo an MRI early this week, but at this point I wouldn’t be relying on him for week 2. Tyler Eifert – Eifert suffered a grotesque elbow dislocation on Sunday and will reportedly miss “a few weeks” to let the injury heal. Eifert was expected to be a big part of the Bengals offense but has been battling injuries since training camp. Jermaine Gresham will see more work, but you’re likely to find a better fantasy option on your waiver wire. Shaun Hill – The Rams second starting quarterback of the year left Sunday’s game with a thigh injury and was replaced by Austin Davis (who?) who threw for 190 yards and a pick after taking over. No word on the severity of Hill’s injury at this point. Neither Davis or Hill has much fantasy value, but obviously if you’re desperate any starting quarterback is worth a look. Jadeveon Clowney – Will miss 4-6 weeks after suffering a torn meniscus. It’s a tough break for Clowney and a big blow to the Houston defense. Even though they looked impressive against Washington, their pass rush was the key to their fantasy value. Chiefs Defense – Both linebacker Derek Johnson and defensive end Mike DeVito suffered torn Achilles and will each miss the remainder of the season. The Chiefs were dominating last season but this is a massive blow. Feel free to explore the waiver wire for other options. Jamaal Charles – Coming off a fantasy MVP season, the consensus top 4 pick struggled mightily against the Titans in week 1 to the tune of 34 total yards. The Chiefs offense looked awful all around so we’ll chalk this up to a one week blip, but it’s still concerning if you spent an early pick on him. Still, don’t panic… it’s just week 1. Dallas Defense – The 49ers offense did whatever they wanted in their matchup against the Cowboys defense jumping out to an early 28-3 lead and never looking back. Dallas was our 32 ranked defense in the pre-season and could be one of the worst defenses in history. Tony Romo – Romo threw three interceptions in the team’s loss to the 49ers. With Romo, you have to expect games like this and he usually makes up for it with quantity as the team passes to come back. While it wasn’t a horrible fantasy day (he still had 281 yards and a score), it’s not a good sign for an offense expected to post big numbers in 2014. Nick Foles – Although his 321 yard, 2 touchdown line doesn’t show it, Foles played a terrible game against Jacksonville in week 1, turning the ball over three times early on. Foles’ numbers were helped largely by Jeremy Maclin’s 68 yard touchdown and came when the team was making a comeback. If you’re a Foles owner don’t panic, this is a powerful offense, but it’s not a good way to start the season. Toby Gerhart – Gerhart rushed for just 42 yards on 18 carries (2.3 ypc) against the Eagles. Gerhart was expected to be the team’s workhorse back and the Jags had every reason to pound the rock up 17-0 early. While this poor performance leaves a lot to be desired, he has a great matchup against Washington’s awful defense in week two so hang tight. Fantasy News and Notes – Week 1 Is Here! Copyright © 2019 Hogstrough.com and its affiliates. All Rights Reserved.